Extra-large embroidery area for large designs, embroider designs up to 400 x 210 mm. Three embroidery hoops included, Choose from a large range of optional embroidery accessories and software. Easy positioning and alignment of embroidery designs, Front load Jumbo bobbin for easy re-threading. Buy a new BERNINA 880AE and receive $3600 in free gifts! BERNINA offers a credit card that has some perks. 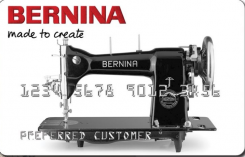 Apply for a credit card and you can get extended financing when you you are buying a BERNINA. We also offer rewards points at The Sewing Palace and when you use your BERNINA credit card for purchases you get double reward points. BERNINA products are manufactured exclusively with high-quality materials-inside and out. This ensures a high level of durability and product performance. The top-notch quality is evident in the precision of the sewing, quilting and embroidery stitches as well as the exceptional needle piercing power through thick fabrics. The Sewing Palace has quite an array of “Previously Loved” BERNINA machines and overlockers. These are a great way to step into a BERNINA at a great price. Not only do you get a wonderful sewing machine to enjoy for years to come, but you get creative sewing experts to help you through your sewing endeavors. Free Mastery Level 2 Class for all Sewing and Embroidery Systems - Learn how to embroider and use the special features of these system. Free classes are included with all of our new, previously loved and consignment machines. Just another reason to buy locally at THE SEWING PALACE!